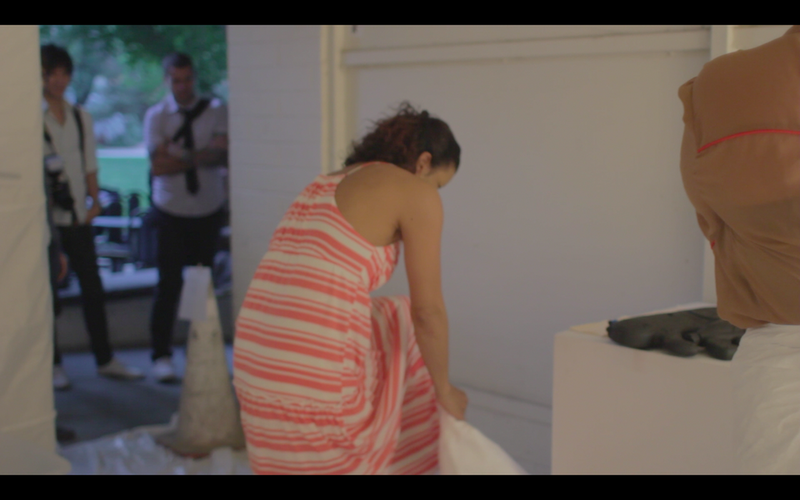 Olivia Jane Huffman constructed an interactive performance in front of Grant Hall Gallery congruent with the UNLV BFA Exhibition 2013. The performance area represents three levels of the human psyche; The Physical Self (audience/voyeurs), The Subconscious (attendee's who join the performance), and The Imagined Self (Olivia Jane Huffman). Eye holes were cut at varying heights in a white sheathed window. 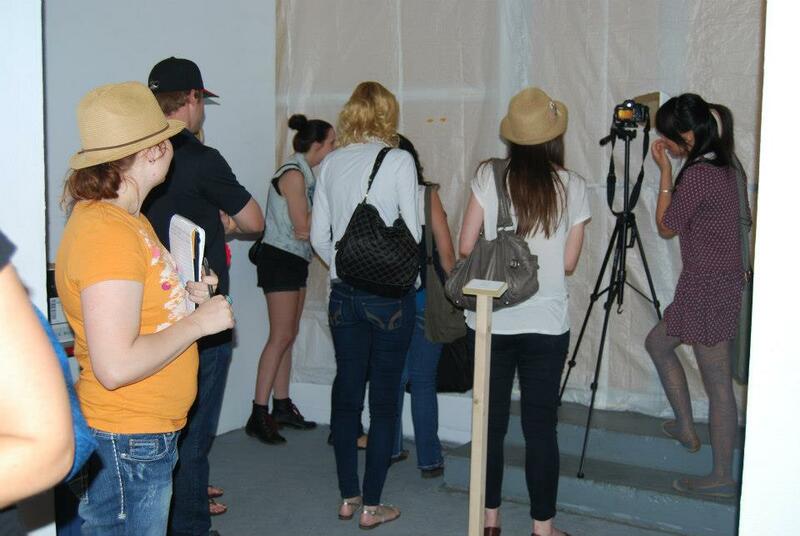 Through natural curiosity, some gallery attendee's peered through the eye holes and Inside the Mind (interactive performance area). As gallery attendee's explored they read flyers posted near the entrance of the performance space. They were informally invited to participate as the The Subconscious. The Subconscious is instructed to wear an anonymizing garment and to use tools that either heal or harm The Imagined Self . Pictured below a participant is getting ready to enter into "the mind". While inside the mind The Subconscious could talk, help, or harm The Imagined self. Subconscious: The Weapon of choice deconstructs internal mental abuse. Each of us has an inner monologue, our subconscious directs us in many paths by orchestrating the imagined self through multiple variations of possible reality choices. Sometimes you can be the cruelest to yourself. This experience pulled people together in healing and in harm at a natural in flux of emotions. "while peering through the eyeholes i felt in another world, but the sounds in the gallery kept me present. it was a really confusing experience. i am not sure what the performance was about, but it became really emotional."